Every year the world is becoming a little bit smaller as more people are able to travel by plane. The International Air Transport Association expects the amount of passengers to nearly double in the next 20 years. 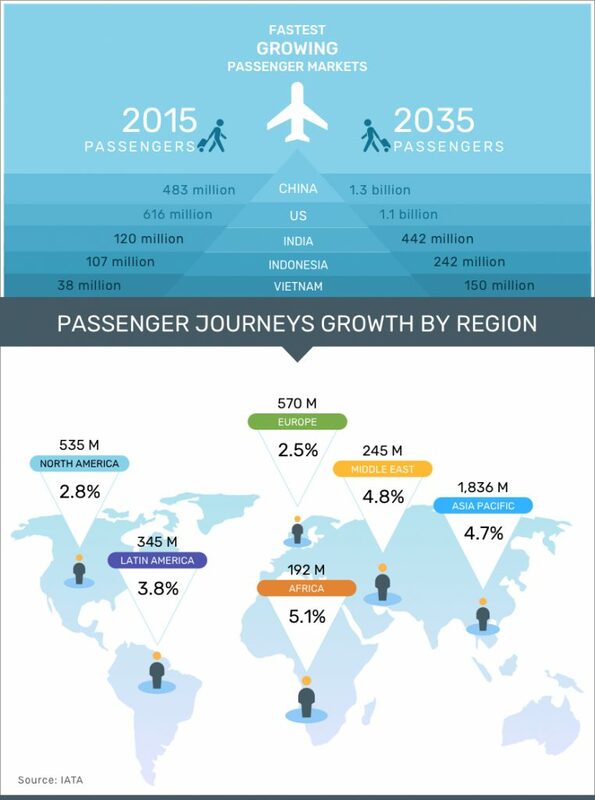 They forecast an 89% change from 3.8 billion passengers in 2016 to 7.2 billion in 2035. Of the top 5 countries expected to produce the most passengers, all but the United States are Asian countries. Asian countries, especially China, have seen a boom in travelers thanks to an increase in flights available from new airlines at affordable prices. For airlines, it's exciting to see such a lift in potential customers, but it's also a daunting challenge for already-taxed infrastructure. To keep up with an ever-increasing demand, airlines will need to evaluate their current operations and airports will have to assess whether or not they need to expand. Depending on limitations from governments and communities, more regulations may spring up, causing a smaller increase in possible passengers than expected. Despite the risks and challenges associated with such a large increase, the opportunities are exciting. With easier access to all parts of the world, businesses and societies can see a positive change in the sharing of cultures between nations.